Northeast Meats, a new meat processing plant in Gardiner, is looking to put more Maine meat on the plates of consumers around the state. GARDINER — The founders of a new meat processing plant on Brunswick Avenue are looking to put more Maine meat on the plates of consumers around the state. Craig Linke, head of the meat processing operations at Northeast Meats, said their goal is to provide Mainers with affordable local meat and allow farmers to keep more of their livestock in state. “I want to see local meats everywhere at a reasonable price,” he said. The 3,500-square-foot processing plant will process and package beef, pork and lamb, all from local farmers, after it’s first shipped to a slaughter facility. They’ll produce a variety of cuts of meats as well specialty sausages. Linke said the company will target the approximately 500 animals shipped out of state each week that end up at large-scale facilities in Pennsylvania and other states. “Trying to keep Maine in Maine,” he said. The company already has lined up around 10 to 12 beef farmers, three farmers for pork and one for lamb, Linke said, from Aroostook County to Windham. The company is awaiting a final inspection from the U.S. Department of Agriculture, probably happening in the coming week, before it can begin processing meat, Linke said. It plans to hire five other people to work in the processing side of the operation. Linke said Northeast Meats will be the only facility of its kind in the state. Some retail stores also perform meat processing, but they don’t sell wholesale, as Northeast Meats plans to do. Jennifer Wade, chief financial officer for Northeast Meats, said the company is in negotiations with large distributors to put its products on the shelves of area grocers. She said it also will deliver the meat to smaller community stores. “We’re trying to find a way to provide a high-quality product but keep it at a fair price, so people don’t have to buy the stuff coming (from) out of state,” Wade said. The venture’s other goal is to create a job-training program for high school graduates or those who dropped out, Linke said. He said he’s looking for another organization to help set up a program to give young people an opportunity to learn how to butcher and process meat. Linke, from Damariscotta, said the venture has been in the works since 2006, although they settled on Gardiner only within the last couple of years. Linke said the company will start processing 7,000 pounds of meat of week and could increase that to 15,000 pounds a week. The project’s second phase includes adding a kitchen that will allow Linke to make value-added products such as pâté and smoked meats. U.S. Department of Agriculture’s National Agricultural Statistics Service doesn’t record the number of animals slaughtered in Maine or the total shipped out of state for slaughter, according to Gary Keough, director of the New England field office. Keough said the vast majority of Maine cattle go to large, out-of-state slaughter facilities. Linke said many of the farmers they’ll be using ship their livestock to Pennsylvania. Commercial slaughterhouses in New England slaughtered around 20,300 cattle in 2012, compared to more than 980,000 in Pennsylvania, according to the USDA. Northeast Meats isn’t the only group looking to grow Maine’s meat industry. The Maine Sustainable Agriculture Society — a Bangor-based nonprofit educational organization serving all types of farmers — has a project called More Maine Meat that’s bringing stakeholders in the industry together. Andrew Files, director of the agriculture organization, said the group is working on surveys for livestock producers and slaughter and processing facilities to give the group a better idea of the industry’s problems. Files said one problems facing farmers is bottlenecking of slaughter facilities in the fall and beginning of winter because strong demand from farmers and hunters. Farmers often raise animals during the spring and summer and have them slaughtered before winter, Files said. He said the Northeast Meats processing plant has the potential to help grow the industry by providing more opportunity to increase the amount of animals that are slaughtered or processed in Maine. Linke said a slaughterhouse would spend only about a day slaughtering enough animals for a week of work at the processing plant. Having Northeast Meats process animals would free up time to do more slaughters, he said. Files said that although Northeast Meats probably will help, another processing facility isn’t the only aspect of growing the Maine meat industry. Files said it will require educating and training more farmers to raise animals year-round to provide work for slaughterhouses in the traditionally down months. Todd Pierce, owner of Spring Fever Farm and West Gardiner Beef, said his slaughterhouse faces seasonal issues, but it still manage to stay busy year-round, slaughtering around 50 heads of beef and pork a week, plus poultry. West Gardiner Beef does slaughtering and processing of cattle, pigs and chickens, mostly for farmers raising the animals for themselves, Pierce said. He said they also do slaughtering and processing for meat that ends up at farmers’ markets. Unlike Northeast Meats, West Gardiner Beef is only for state slaughter and processing. The operation could benefit from the training aspect of Northeast Meats’ plan, though. Pierce said one of his biggest challenges is finding new workers. Most of his 10 employees have been at the facility for at least 10 years. 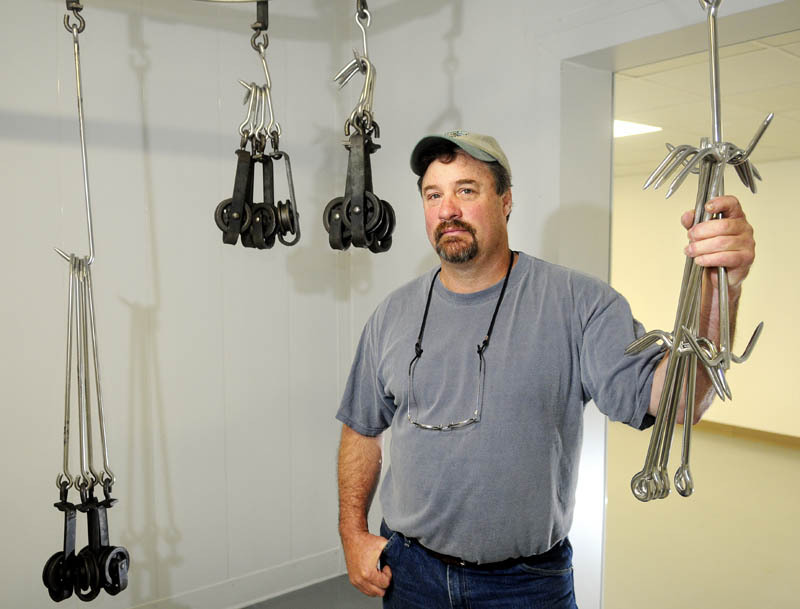 Bill Lovely, of ABJ General Construction in Gardiner, owns the processing plant building and property with his wife and is leasing it to Northeast Meats. He and his wife are both shareholders in the company as well. He said Linke owns the largest share of the company — 40 percent. Lovely became involved in the project when Linke came with plans to convert an old building into a processing plant. Instead, Lovely said he suggested it would be cheaper to build a structure. He said the venture was funded by personal contributions and commercial loans. Lovely praised the Gardiner city staff for its help in getting the project through the Planning Board process and with ensuring the building and equipment met codes. Nate Rudy, director of economic and community development for the city, said the staff gave the same effort they would give to anyone serious about bringing a business to Gardiner. Northeast Meats also doesn’t plan to stop at just a processing plant. Lovely said it plans to open a store at some point in downtown Gardiner to sell its products. He also said it has plans for a related project in Libby Hill Business Park.